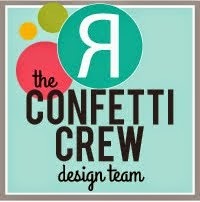 Hi Krafty Friends! Welcome to Day # 4 of March Krafty Peeks! 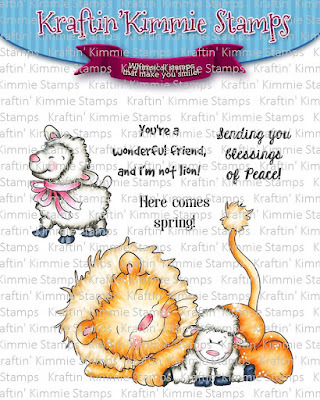 Today I have a card to welcome in Spring with the adorable Blessings of Peace Stamp set by Artist Cheryl Grant. You know what they say about March...it can come in like a lamb or in like a lion. Well either way this Blessings of Peace Stamp is sure to make your heart roar!!! This sweet New Blessings of Peace Stamp set features a lovely lion and his lamby pals!!! It features two main images plus three sweet sentiments! 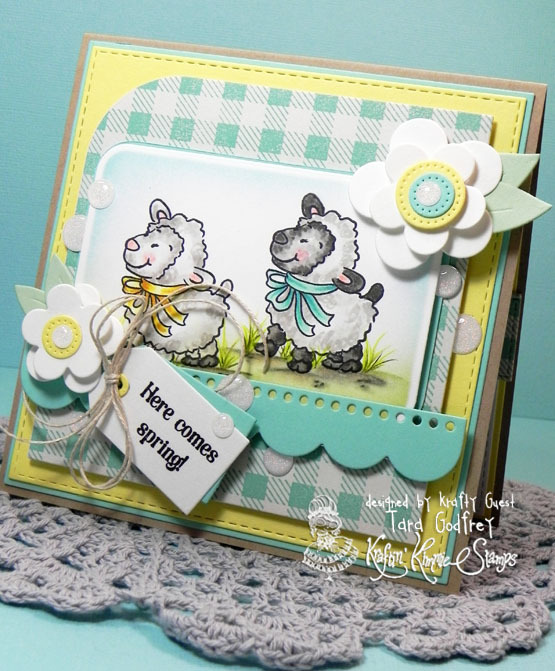 Such a perfect spring set that can be used for so many things...even a sweet baby card! I used MFT Banana Split, Spearmint, Grout Grey and Kraft Heavyweight Cardstock and Reverse Confetti Iced Aqua and Cloud Heavyweight Cardstock. 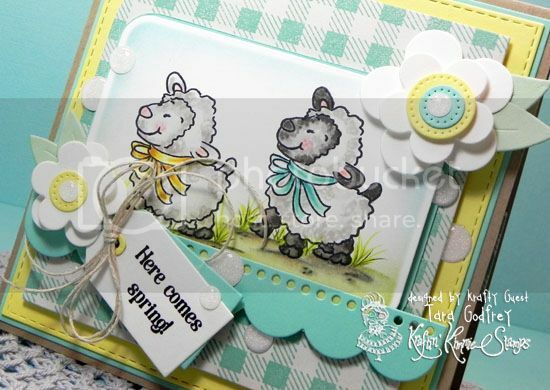 I stamped two little lambs "marching" in Spring from the Blessings of Peace Stamp set and coloured them up with my Copics. I cut the image out with the rounded rectangle die from Blueprints 14, left the image in the die and inked with Tumbled Glass and Shabby Shutters Distress Ink. I turned to my Prismacolor Pencils to colour in the ground and grass to anchor the images of the sweet little lambs. I stamped the MFT Gingham Background stamp with Memories Waterfall Blue Pigment Ink on Grout Grey Heavyweight Cardstock. 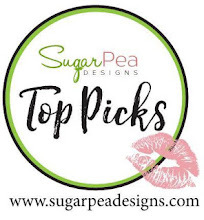 I stamped a sentiment from the Blessings of Peace Stamp Set on Cloud White Heavyweight Cardstock cut with the tag die from Blueprints 2 and tied the tag with some hemp cord. I made some spring flowers with Blueprints 12 and embellished with some white sparkly Gumdrops. I finished up the inside of my card too...I stamped a shadow image of the little lamb in Grout Grey Premium Dye Ink. The sentiment is from the Hoppy Friends Stamp set (tomorrow you will see the peeks for the Hoppy Friends Stamp set). 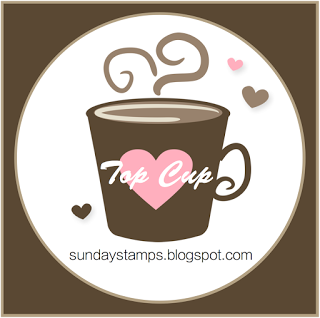 Thanks for stopping by and having a little look at my card for the Kraftin' Kimmie Stamps March Peeks! Don't forget to join us at the LIVE Online Release party beginning at 11am EST! Come join us to help celebrate the new release, check out lots of krafty kreations, have a chance to win some prizes and hang out with all our krafty friends! Hope to see you there! amazing work! those critters are just the sweetest thing! Love that you used two sheep and the spring colors. And I think it makes the card special that you finished the inside too. It's so nice to see your work again Tara!!! Your cards are always amazing!! All of the extra time and detail you put into them. Thanks for sharing!! So Sweet. Love the softness of the spring colors! Decorating the inside is like having two cards! 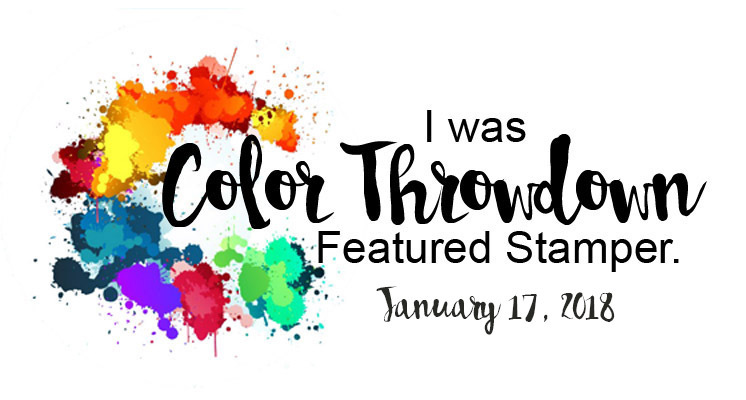 Pure eye candy with your wonderful coloring and design! Thanks for the inspiration. I love this card! So fresh and springy. And just beautiful! Very cute..Great job!!! 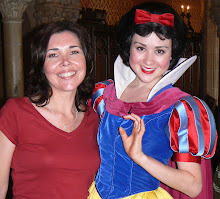 Love your colouring!! Love how you made the same sheep to look different!! Great job! !